— even in the smallest amount (as the stairs turn in front of foyer window) was not how I wanted to represent myself. We wanted to replace it eventually anyway, so we decided to pony up. Yet, I also didn’t want to replace it with yet another neutralish, beigish, blahblah nylon carpet. I wanted something fresh, something with a little color, and something with a little class. We don’t exactly live in a finer home decor and design Mecca here in central/northern New Hampshire. And, with two little boys, I didn’t feel like hoofing it the 1.5 hours down to the Boston Metro area and subjecting them to a day of scouting carpet showrooms only to be told that we lived too far away for the installers to come and measure our stairs. So I started scouting online. I knew I could find runners for straight stairs, but mine have a landing and turn. Who could create a runner for me without being present to measure? In my searches, I found one online vendor that not only creates runners for turning stairs, but actually makes a specialty of it — The Rug Depot. 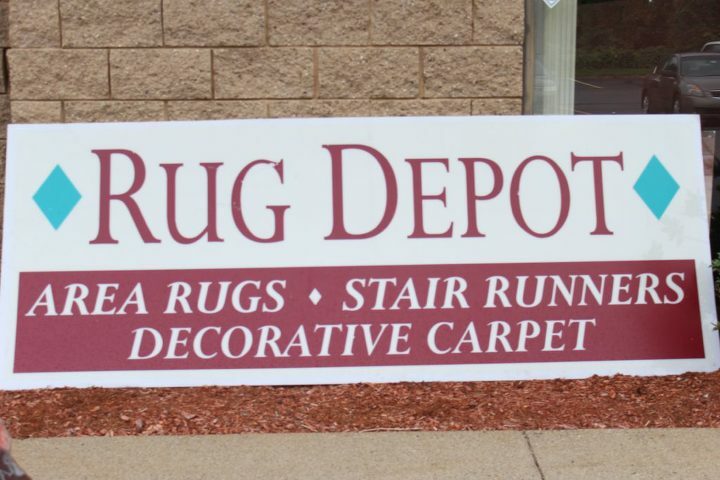 Rug Depot has a huge selection of all-wool runners (many in stock) and carpets from some of the best names in the industry, including Stanton, Couristan, Nourison, and Prestige Mills. With some basic measurements, owners Pat and Jeanie Intintoli determine how much footage is needed and can explain the options for mitering and finishing. The runner is then shipped to you, and you contract with a local carpet installer. 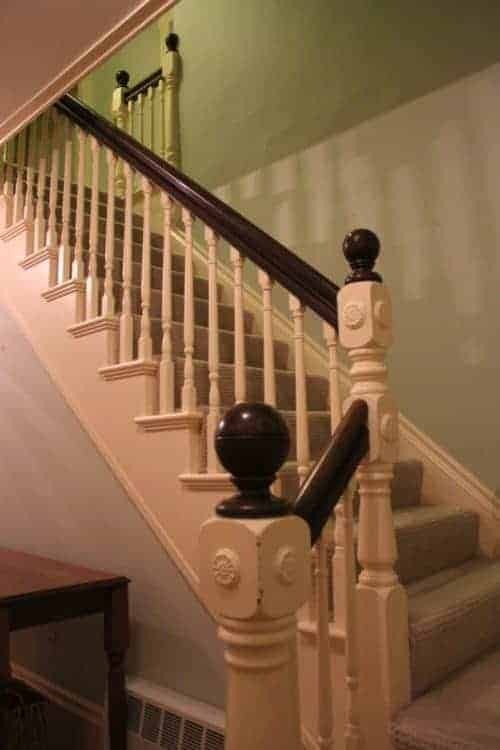 If you’re feeling skittish, I recommend a phone call and emailed photos rather than just using the website if you have a complex stair/hallway situation. 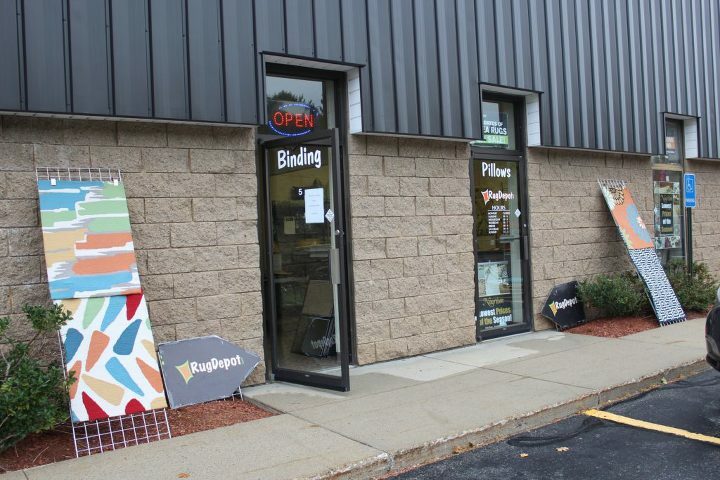 Funny enough, Rug Depot is another one of those “You’re kidding me, this place is in New Hampshire?” vendors for me. It’s still 40 miles away, but that’s a piece of cake. 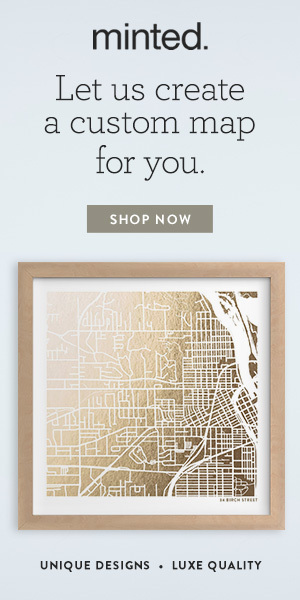 I have to go that far to find a Pottery Barn or West Elm. So I did drag my boys down there and hooked them up to a video player while I had fun. It’s pretty basic on the outside, but inside I had lots to look at! In stock and ready to ship runners. And lots of other rug/carpet options, too, in addition to what is listed online. For this project, I wanted to use a carpet cut to be a stair runner, something that was in my “fresh, classic” style, but also charming — the way I want people to see my particular home. And while wool/nylon blends are great for runners, ideally I wanted all-wool. I settled on this pattern from Couristan. I loved the pretty apricot on ivory, which so beautifully complemented the Pirates Cove Beach and Linen White Ben Moore colors. You better believe I had this pre-treated for stains, and I even ordered a few extra feet in case the worst happened. But wool is pretty darn resilient. You don’t even want to know some of the pet and boy messes I’ve gotten out of my wool rugs (including on white parts), and you can’t even tell they were there. Stairway to my design heaven. In this pic you get a couple of sneak peeks — one to my window treatment down at the base of the stairs and the other at the rug I chose for the upstairs landing (looking a little browner here, because of the light). This is the Shingle Stripe rug in Capel Rugs‘ Hampton line (wool blend). There are some really colorful options — without being over-the-top — that I’m also dying to use in a project! Capel is an American company, with hundreds of Made in the USA options, and they contract for many of the Big Boys — such as L.L. Bean and Ballard Designs. Can you guess who also carries the Hampton rug I chose (but at markup and under a different name)? Capel rugs are available through many rug and carpet distributors (including Rug Depot) and now through designers (like me) as well! A detail for the rug I chose for the foyer. This was actually the second piece I chose for this project, after I bought the painting (see my artful inspiration). It is hand woven wool by Gregory Newham, and it is soooooo soft. I really want one of his rugs in my “someday” master bedroom. I first found Gregory through his Etsy shop, Fitch Studio Weavers, where I bought this rug and where he sells prototypes, strike-offs, and some runners. I have to admit, when I found the Couristan Ardmore with it’s smaller scale diamond pattern (the eye likes shape repetition but it’s always good to mix scales) and the way it related to my Newham rug, I knew it was right! The Etsy shop piqued my curiosity, and only after a little research did I find Gregory’s main business. Then, once I knew his patterns, I started seeing his work everywhere, including in one of my all-time favorite bedrooms by the venerable firm Cullman & Kravis. Someday, I’ll probably do a whole blog post on him, because his work is really beautiful, and he deserves to be more well-known! ATG Stores is offering ORC followers a discount right now. Use code: OneRoom100 to receive $100 off your order of $199 or more. Thoughts? Questions? Input? Have you been trying to convince your Significant Other to choose a certain color for a room, but he/she is still reluctant? This Saturday I’ll be back with fresh, classic rooms in every hue that no one could resist. And next Thursday — the final reveal of my foyer. ‘Til Saturday!